“Humans love a good story!” Yes! 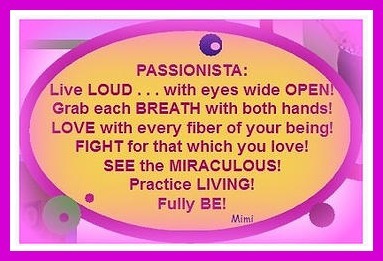 Enter Passionista At Large. I love stories. I love to tell stories. I love to read stories. I’m a voracious reader. And I seriously struggle with non-fiction unless it’s written in a storyteller-like way. When I was teaching elementary school I turned everything I could into a story. I knew that it was the best way I learned, and figured my students could benefit too. Now there is research to prove it. This Is Your Brain. This Is Your Brain On Fiction. Yay! Right on Mrs. Matthews! It makes me feel really good to know that all my guilty-pleasure-reading (fiction, honey!!) is serving a major purpose keeping my brain active and healthy. YAY!! Grow those dendrites!! My only difficulty is that once I start a good book I struggle to put it down. When I know there are a lot of things I need to do, I hesitate to pick one up….because the dishes stay dirty and pile up, kids forage for their own food, my desk keeps piling higher with mail, bills, to dos, and all the things I remove from the kitchen so we have room to eat. Mysteries and forensic novels intrigue me. If it’s well-written, I usually don’t figure out “whodunnit”, and my brain keeps trying to. I really, really want to read the ending so I can just relax, for Pete’s sake! That reader’s anxiety is tough! But I can usually control myself–unless it’s so well-written that I need a Xanax, and have to put myself out of my misery! And by the way, I doubt I will have an electronic reading device any time soon. Yep, I’m a sensory person. 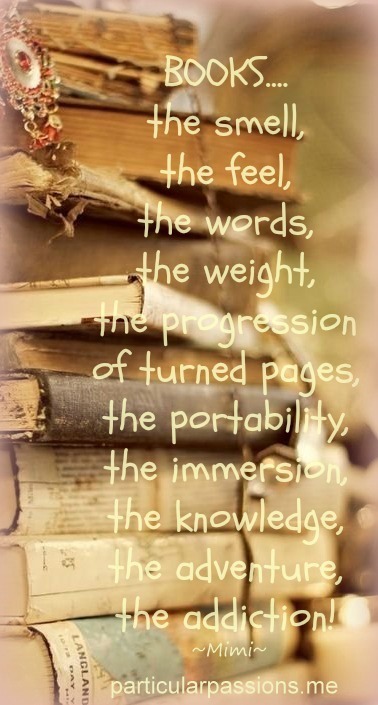 I like the feel of holding a book, turning the page, the smell of books, and the progress of the bookmark. AND seeing how much is left until I know how it ends! Ok, well this has been your Public Service Announcement on this Friday in the frigid north, where in the last 24 hours we have had snow, rain, sunshine, freezing, and no school (for the umpteenth time). Sounds like a really good day to stay inside and READ! Oh Sanity, where art thou? Y’all stay warm and have a great day. If your brain is feeling foggy, mushy, and in need of new dendrites, take a trip to the library, where books are free. There is a wealth of them. And you can touch, smell, hold, and flip pages as much as your heart desires. Hi Mimi, I love your post, and books as well. I have several books by my bed side waiting for me right now. I got an ereader but like you said can not replace real books. Have you read Sarah Waters’ novels? I’m usually a non-fiction gal, but I was hooked on her stories. She definitely has a way of keeping you emotionally engaged. No I haven’t but it sounds like I need to! I ALWAYS have a stack of half-read/intending-to-read books next to my bed. Like you, I will NEVER own an E-reader. I enjoy the feel of a book in my hand, and seeing that bookmark (usually a boarding pass) slowly advance. After they are read….books are like trophies lined up on shelves….I can also pass them on to someone else who absolutely NEEDS to read it. Thanks for an agreeable read…..
Hi Mimi, Thank you for following my blog, and now I’m checking out yours! I’m reading a book called Double Luck, Memoirs of a Chinese Orphan, by Lu Chi Fa. I was in Morro Bay, California last week appraising a hotel (that’s what I do when I’m not blogging!). I went for breakfast at a tiny cafe that a fisherman recommended! The owner and chef, Lu Chi, and I struck up a conversation. I told him about my work in Cambodia. He said “You need read my book.” Amazing little gift from God. I’m sure you’ve heard from Laura about our “Inner Critic”. You haven’t seen anything yet, until you hear the voices in this small boy’s head. Have a great day!